Bees and brambles: also known as blackberry bush - or Rubus fruticosus, research shows each bramble flower secretes lots of nectar for bees! 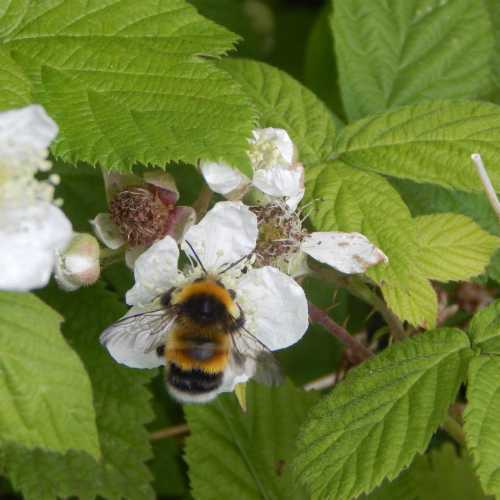 Bees love brambles (otherwise known as blackberry) - Rubus fruticosus, so a scrubland, waste area, garden or hedgerow which includes brambles is fantastic for bees – and of course, other pollinators. If you want to capture some nice photographs of bees, head for a patch of brambles! 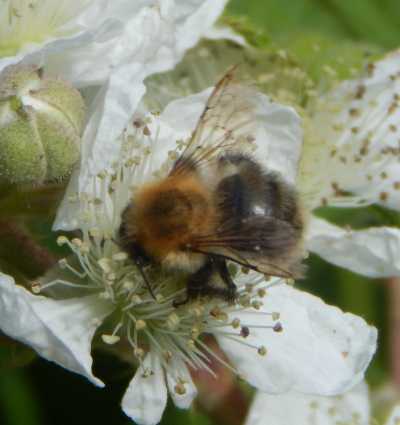 From around June onwards when the brambles are in flower, busy bees of all kinds of species can be seen foraging on the pretty white flowers. It seems brambles can grow just about anywhere. We had them growing on our allotment, with its rich, loamy soil. Walking down our country lane, the native hedgerow features a few specimens, and they also occupy a scrubby area, along with wild roses and buttercups. Then again, an old brownfield site where I take our spaniel for walks, has lots of brambles, as does a nearby coastal area of sand dunes. Brambles like full sun, but we have a specimen growing in our garden. It thrives in semi-shade. I cut it back harsh last year, and this year (2017) it has grown back better than ever! Brambles provide nectar for bees, and the prickly stalks can also help to provide dense, shady cover for nests, especially for bumblebees. Dead, hollow bramble stems can provide nest sites for solitary bees, and shelter for overwintering solitary bees. 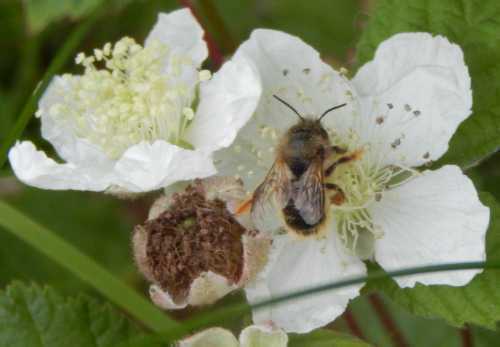 Bees and brambles: how much nectar do brambles provide for bees? 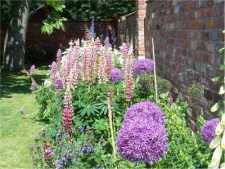 In 1946, M. S. Percival, a botanist at the Department of Botany, University College of South Wales and Monmouthshire, Cardiff UK, decided to make this the subject of a study called: "Observations on the flowering and nectar secretion of Rubus fructisosus". 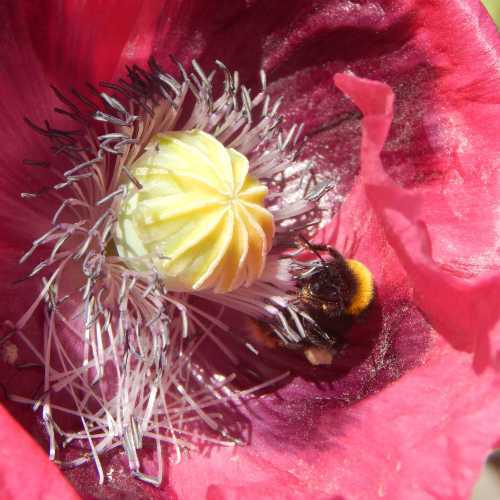 Percival's motive for conducting the study were that knowledge of the secretion of nectar in plants, and factors affecting 'nectar flow', were scanty, and yet it was noted that nectar flow is important to beekeepers. Rubus fructisosus (bramble) was a major source of nectar for bees (including honey bees) in some parts of the region (Glamorgan). Percival hoped that this work would help form a basis for further work on the subject. Nectar sampling was achieved with the use of glass tubing and a rubber teat to draw out the nectar. The volume of nectar could then be measured. Insects were prevented from feeding on the flowers by the use of muslin which was used to cover the florets. 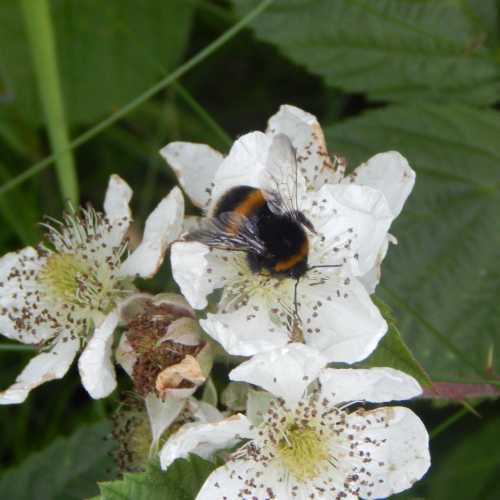 The results help us understand the value of brambles to bees as a nectar source, and why bees visit brambles. Nectar secretion began before the petals started to unfold, and finished when the petals had fallen and the filaments of the filaments of the stamens incurl over the carpels. 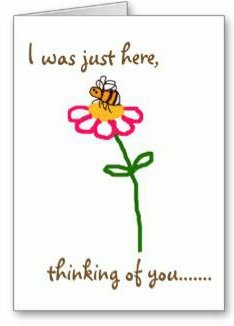 I find this point especially interesting, as I have often observed bumblebees hovering around unopened flowers, and had hypothesized that bees could detect the nectar within the flower - they just could not yet get to it. The amount of nectar secreted by flowers varied widely, but flowers on healthier, thicker shoots produced more nectar than thinner, weaker shoots. The average life of flowers was 90 hours, with terminal flowers (flowers at the top of plants stems) opened first and lasted the longest. Nectar secretion for all flowers was at its highest levels for the first 3 days - but especially the first day. After the third day, nectar secretions reduced significantly. The amount of sugar secreted per flower varied from 3.7micrograms to a whopping 19.5micrograms per flower. (Note 'sugar' not being the same as 'nectar'). No wonder bees love brambles! It seems the more flowers the plant has in bloom, the higher the level of nectar secretion. Thus, on days when a large number of flowers were in bloom, the average nectar secretion of flowers per bloom was higher. When a relatively small number of flowers is out, the average secretion per bloom is lower. As if the wonderfully delicious fruits are not enough to tempt you already, you may like to establish a blackberry patch in your garden. I have just a couple of bramble plants, indeed, most of my soft fruit crop is raspberries rather than blackberries, but this is largely due to space. If you have a small garden like I have, brambles may not be the ideal choice for you - it all depends on how you use your space and what you want from it. 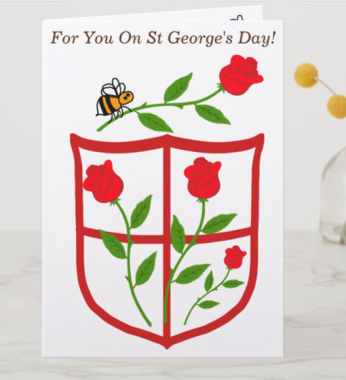 On the other hand, a brambly hedgerow could help to act as a fabulous barrier: bees on the brambles, fruit for you (and any left overs for birds and small mammals), and thorns to help protect your garden form intruders. I deliberately chose a cultivated variety, rather than a very vigorously spreading wild variety - it would have been easy to take one of these from the allotment. I had already discovered that wild brambles are great to help encourage pollinators to the allotment, but it was difficult keeping them out of vegetable beds once they were already established there. Anyway, the best time to start planting blackberries is early in the spring. Water the plants after you put them into the ground. Some people cut the stems of the plant a little straight after planting, though I didn't bother. You probably won't get berries the first year if the plant is very young. I've had blackberries for a few years now, and I cut them back every year in autumn after the fruits have been picked. As stated above, last year I cut them back especially hard, and this year, and the plant is looking better than ever - hence more bees on the bramble flowers than previous years. I'm therefore hoping for a good crop!